The Conservatives are at their zenith. Junior doctors are under attack. The welfare state is being dismantled in the name of ‘balancing the books’. The Government is preparing to sell-off council houses. Green policies are being cut. Thatcherism is going from strength to strength. This is before I even begin to mention Tory attempts to redraw constituency boundaries or cut the short money going to opposition parties. It is against this backdrop that progressive parties face the biggest ideological challenge in a generation. Britain desperately needs a progressive alternative to Tory austerity. The truth is that neither the Labour Party nor the Liberal Democrats are currently in any position to stop the Conservatives by themselves. The two historic parties of the progressive left need to start working together. The history of Labour-Liberal Democrat cooperation stretches back to the initial Lib-Lab Pact of 1903. Between 1977 and 1978, the Liberal Party propped up James Callaghan’s government. The first Scottish devolved government was a coalition between Labour and the Liberal Democrats, which lasted two terms from 1999 until 2007. This is not to overlook the fact that there are large philosophical differences between socialism and liberalism. Security, foreign affairs, individuality and collectivism have often been sources of conflict between Labour and the Lib Dems. However, what unites the two parties is their commitment to social justice. Both parties after all had a hand in creating the NHS and the welfare state. A progressive left alternative to the Tories will have to form a common agenda of social justice and political reform agreed to by Labour and the Liberal Democrats, as well as the Greens, and possibly the SNP and Plaid Cymru. This is idea was supported by Tim Farron shortly after winning the Liberal Democrat leadership. The progressive parties must stand united in opposing Tory attacks the NHS, education and social security. If that means that senior members of different parties have to share a platform, so be it. The progressives must show a united front against the Tories. Labour and the Lib Dems must change the narrative on the economy. The Conservatives are currently pursuing an ideological aim of trying to shrink the state. What the economy needs now isn’t reckless slash and burn economics that undermine public services and social cohesion. What the economy needs now is investment in infrastructure (especially in housing and renewable technologies), job security (by strengthening, not eroding workers’ rights) and less inequality (by reversing many of the welfare cuts). One major road block to defeating the Conservatives is the first past the post voting system. Their dominance at the general election will only get stronger once the new constituency boundaries come into effect. Sadly the progressive opposition to the Tories is divided by geography. Labour continue to dominate the urban North, South Wales and London. Whereas in the South West, and many rural areas in the North and the Midlands, the Liberal Democrats are the main opposition to the Tories. To put it bluntly, the voting system helps the Tories and undermines progressive parties. The common agenda on political reform must revolve around abolishing first past the post. I am very encouraged by moves lead by Chuka Umunna to introduce proportional representation through a cross-party alliance. Proportional representation is essential for making Britain more democratic and for re-engaging those people currently alienated from politics. Until proportional representation is introduced Labour and the Lib Dems will have to start thinking the unthinkable — local constituency pacts, where progressives (Labour, Lib Dems and Greens) in Tory facing seats agree to support one candidate who is committed to social justice and the introduction of PR. The former Lib Dem MP for St. Ives, Andrew George suggested similar local constituency pacts before the last general election. Pacts should be pursued on a local level; a national pact would be impractical and unworkable. 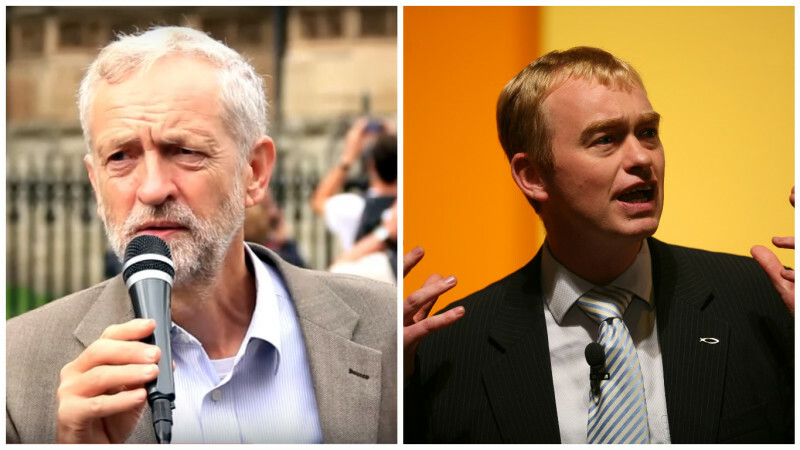 There is much scope for progressive cooperation; it has even been reported that ‘secret talks‘ have occurred between Jeremy Corbyn and Tim Farron. A united progressive front in opposition to regressive Tory policies is essential. The most vulnerable in our society depend upon it. A common agenda and local pacts are a necessity. Labour and the Lib Dems must start working together. The alternative is watching the Tories dismantle everything they hold dear. Paul Hindley is a Liberal Democrat activist from Blackpool and a member of the Social Liberal Forum. Absolutely right. There is no need for the Labour Party to split, or a realignment of the left, merely some cooperation between Labour, Lib Dems, Greens and Nationalists. We must remember what happened in the 80s and not gift future general elections to the Conservatives. Why would Labour want a pact with the Libs who helped bring down Labour and formed a pact with the Tories who then with Liberal approval proceeded to screw the poor into the ground. Jimmy, it was the voters, not the Lib Dems, who brought down Brown’s Labour Government. And Labour declined to try and form a government with Lib Dem support. Despite being very junior partners the Lib Dems did stop the Conservatives screwing the poor to the extent they are now. If we want to help the poor then we have to ensure a progressive government after the next election, and the best way to ensure that under first-past-the-post is for centre left parties to work together and focus on attacking the Conservatives, not each other. I’m sorry, but given that the Lib Dems supported the 2012 Health & Social Care Act that effectively set in train the wholesale privatisation of the NHS, most of us on the centre-left (I’m a Green Party member) will be at best suspicious of , at worst openly hostile to any deal with them. They still appear to be committed to the Orange Book, about which they still keep very quiet, and seem to be much closer to the Tories in terms of their liberal ideology – their calls for a centre-left or progressive alliance seems to be root din their anger at bearing the full force of the electorate’s anger over the coalition government. Douglas, I share your apprehension, but would not give up on the Lib Dems. In coalition they did much they surely now regret. I am not a member of any party although a one time Liberal and more recently, until Iraq, a member of the Labour Party. However, I do not want to see another, unfettered, Conservative government based on the support of a quarter of the electorate.